« Maintenance Items and then off to more fun stuff! This was a let down and we didn’t have much time because we needed to get me to an airport in Dallas by the 25th. Natchez Trace Parkway is all about the history and without much time we decided we should save this for another time. We did spend the night in one of their great campgrounds and traveled about 75 miles but then we chose to exit. Before we did we saw a mom and 2 fawns that were so small! I think they were only a few days old. Good thing they are way south. When we found a way off the parkway we came across a very cool eatery! Big Joes BBQ. The lot was a mess and inside were several locals having lunch at a small round table. The only other table in the place was covered with stuff; bills, newspapers, napkins! Definitely not inviting but the guys eating said “just move that aside and have your lunch!” Ok, that’s what we did. There was an young guy behind the counter that took Pauls order and disappeared. We realized he went out to get the ribs of the BBQ! I got the biggest baked potato with at least 3/4 c of butter lathered right up on top! So we sit down and then the old guy comes out and takes a seat. I’m tasting Pauls beans and they were good, very smokey. So the old guy says “you want your own beans?” I’m thinking sure, but I have this huge baked potato and a bunch of pulled pork but he gets up, takes my plate and loads me up some beans! Then he wants to know what is wrong with the butter that I’ve moved to the side! Nothing, just too much. He says “thats not much butter!” And then he sells Paul one of his T-shirts and invites us to his church for BBQ and to watch the big game! Tennessee and Alabama! That was an experience that you just can’t plan and his BBQ was delicious! 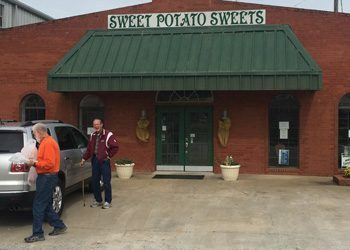 I didn’t even know the best sweet potatoes come from Mississippi. This little shop had all kinds of goodies; cookies, breads, pies, whole sweet potatoes! The bread was delicious. This entry was posted on Wednesday, October 24th, 2018 at 1:11 pm	and is filed under Mississippi. You can follow any responses to this entry through the RSS 2.0 feed. Both comments and pings are currently closed.